The Miller/O'Neill/Hyde author team continues to offer an enlightened approach grounded in the fundamentals of classroom experience in Beginning Algebra 4e. The text reflects the compassion and insight of its experienced author team with features developed to address the specific needs of developmental level students. Throughout the text, the authors communicate to students the very points their instructors are likely to make during lecture, and this helps to reinforce the concepts and provide instruction that leads students to mastery and success. Also included are Problem Recognition Exercises, designed to help students recognize which solution strategies are most appropriate for a given exercise. These types of exercises, along with the number of practice problems and group activities available, permit instructors to choose from a wealth of problems, allowing ample opportunity for students to practice what they learn in lecture to hone their skills. In this way, the book perfectly complements any learning platform, whether traditional lecture or distance-learning; its instruction is so reflective of what comes from lecture, that students will feel as comfortable outside of class as they do inside class with their instructor. Connect Math Hosted by ALEKS Corp. is an exciting new assignment and assessment ehomework platform. Instructors can assign an AI-driven ALEKS Assessment to identify the strengths and weaknesses of each student at the beginning of the term rather than after the first exam. Assignment creation and navigation is efficient and intuitive and the gradebook, based on instructor feedback, has a straightforward design and allows flexibility to import and export additional grades. The online exercises and guided solutions were developed with the help of our experienced instructors and ALEKS Corporation to ensure consistency between the text and digital resources. ALEKS- Assessment and LEarning in Knowledge Spaces is a Web-based, artificially intelligent assessment and learning system. ALEKS uses adaptive questioning to quickly and accurately determine exactly what a student knows and doesn't know in a course. ALEKS then instructs the student on the topics she is most ready to learn. As a student works through a course, ALEKS periodically reassesses the student to ensure that topics learned are also retained. ALEKS courses are very complete in their topic coverage and ALEKS avoids multiple-choice questions. A student who shows a high level of mastery of an ALEKS course will be successful in the actual course she is taking. The worked examples offer a clear, concise methodology that replicates the mathematical processes used in the authors’ classroom lectures. 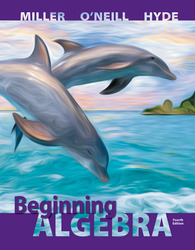 To ensure that the classroom experience also matches the examples in the text and the practice exercises, the authors have included references to even-numbered exercises to be used as classroom examples. These exercises are highlighted in the Practice Exercises at the end of each section. Tip and Avoiding Mistakes boxes have been created based on the authors’ classroom experiences and have been integrated into the worked examples. Thee pedagogical tools will help students get better results by learning how to work through a problem using clearly defined step-by-step methodology. Problem Recognition Exercises present a collection of problems that look similar to a student upon first glance, but are actually quite different in the manner of their individual solutions. Students sharpen critical thinking skills and better develop their ‘solution recall’ to help them distinguish the method needed to solve an exercise, an essential skill in developmental mathematics. The Board of Advisors partnered with our authors to bring the best applications from every region in the country. These applications include real data and topics that are more relevant and interesting to today’s student. Each chapter concludes with a Group Activity to promote classroom discussion and collaboration, helping students not only to solve problems but to explain their solutions for better mathematical mastery. Group Activities are great for both full-time and adjunct instructors, bringing a more interactive approach to teaching mathematics. All required materials, activity time, and suggested group sixes are provided in the end-of-chapter material.